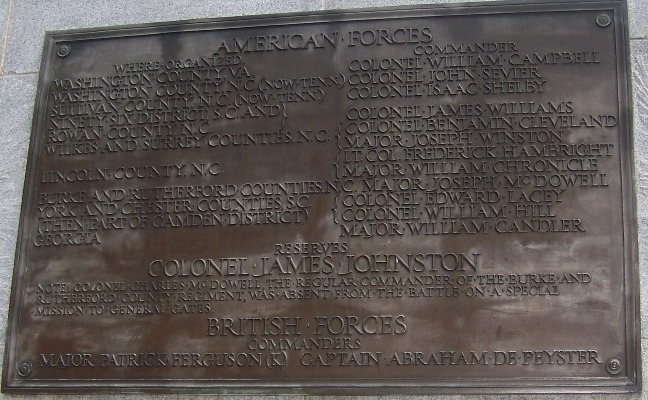 The bronze plaque on the west face of the 1909 Kings Mountain Battlefield monument presents a distorted feeling of military organization which was almost totally absent from the 07Oct1780 event. Omissions, errors and inaccuracies on the plaque further detract from understanding the battle and its participants. Families and neighborhoods of some named men take unmerited pride while some omitted names fail to fill their proper places. Imagine the sports page report of an all star game, but one of the teams is unnamed, some named players were not there, some who scored were omitted from the statistics, the tactics of the teams are not mentioned, the final score is not given, and which team won is obscured. The remnants from the centennial committee had other people’s money to spend. The DAR had area families whose reputations they wanted to sustain. The War Department had the files and archives, but the Corps of Engineers brought only design and construction assistance, not the records of the battle. I paid the US Park Service $34.50 for a copy of Lyman C Draper’s Kings Mountain and its Heroes. It is used as the source for many battle detail accounts. Dr. Draper had letters written by my grandpa (ggg). He referred to them as his source, but the book printed stuff different from the letters. One example of the fake history, Newell’s letter named Private Richard Gist as a Virginian wounded in the battle. The book names Lt. Nathaniel Gist as that wounded Virginian (Nathaniel was three states away from the battle). $34.50 for fake history, I wonder what the real story would cost. The Army War College account in the congressional record of 1928 (document 328) better describes the Battle of Kings Mountain than many other accounts. Patrick Ferguson had the only red coat. His continental regulars’ guard post occupied Indian Knob, the highest point at the SW end of the ridge. Ferguson also had loyalist militia recruits from the Carolinas resting on the ridge on their way to join Lord Cornwallis’ army in Charlotte. Colonel William Campbell, functioning as American general, divided his militiamen into four columns of about 230 each to deploy and encircle the boot shaped mountain. After Captain Colville’s company attacked the guard post, Ferguson organized a bayonet charge down the south side of the ridge. The Virginians retreated down into the woods. Meanwhile Colonels Shelby, Williams, and Cleveland attacked the rear of the enemy from the north. Ferguson turned the bayonets around against them and the Americans retreated down the north side. Meanwhile, Campbell, Sevier, and McDowell’s men regrouped and attacked again from the south back up the ridge into the rear of Ferguson’s regiment. Ferguson reorganized and again attacked south driving the patriots into the woods, but not so far. Again the north side came back against the rear of the dwindling bayonet line. Three times, they “shoe shine ragged” up and down the slopes before the frontier rifles had taken such a toll that Ferguson was dead and his surviving force surrendered 1200 stands of arms (there were partial attempts to surrender earlier). The largest letters on the west face show James Johnston commanding reserves. Johnston had no apparent part in the expedition or the battle. If there were reserves, they were the overmountain men without good horses who stayed at Cowpens on Friday night 06Oct1780. Most of these “reserves” rejoined the fighters at Buffalo Creek on the north side of Broad River on Sunday to herd the prisoners away from Charlotte and Cornwallis’ men. If Johnston had a reserve force to rejoin the BKM vols, they could have been of great service in escorting the prisoners to the Moravian Towns. The most conspicuous entry on the west face is Colonel James Johnston. 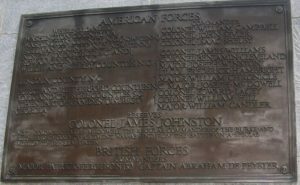 For some reason, the font is larger than even the title “American Forces” at the top of the bronze plaque. The plaque indicates that he was commanding reserves. The only force resembling reserves were foot soldiers and less able horses left at Cowpens on Friday night 06Sep1780. The other Colonels did not report that they had reserves. Without any knowledge of Johnston’s whereabouts, no means of communication, and little time before Ferguson could reach Cornwallis, there was no way to employ reserves. Johnston was a militia officer and politician from the area of Lucia in current Gaston County near the Catawba River. Abraham Forney served under Captain James Johnston in 1776. Forney was also a patriot at BKM, but under Colonel Graham, not Johnston. L.C.Draper named Johnston as a captain at BKM under Hambright. (Draper’s index shows Johnston at page 577, but he is actually at page 477.) Bobby Moss relied on Draper as his source for naming Captain Johnston at BKM. Historian William Anderson in http://elehistory.com/amrev/LincolnCountyMenAtKingsMountain.pdf excludes Johnston from mention. Hayden Asbury of NC State did not favor the proposition that Johnston fought at BKM https://www.ncpedia.org/colonel-james-johnston . Colonel William Campbell was chosen to function as general of the patriots while Colonel Charles McDowell went to Hillsborough to obtain a properly commissioned general. With Campbell in this elevated function, Major William Edmondson became the functional colonel of Campbell’s Virginians. General Gates retreated from Camden SC to Hillsborough NC when his army was defeated. Georgia and South Carolina were out of business as functional states, now controlled by the British and loyalists. North Carolina Governor Abner Nash was sheltering South Carolina Governor John Rutledge and the continental general Gates in Hillsborough. Both Rutledge and Nash commissioned Colonel James Williams to function as a general by raising North Carolina troops to join his wandering South Carolina militia. Col Williams recruited three companies from Caswell (some from Roxboro, current Person County) County and added a company on their way through Rowan County. The plaque misspelled Surry County. It combines Wilkes and Surry. Surry County militia Colonel Joseph Armstrong dispatched Major Joseph Winston with a company in response to Colonel McDowell’s call. The Surry County men marched with Colonel Cleveland’s Wilkes County men to Quaker Meadow. The Wilkes and Surry men fought in separated sectors of the battle. The Lincoln County militia was commanded by Colonel William Graham. Before the battle, Graham was called to an emergency at his fort on Buffalo Creek. Command passed to Lt Colonel Hambright who asked Major William Chronicle to take charge. Chronicle had used Kings Mountain for a deer hunting camp several times with his father. Major Chronicle was KIA, but unlike Ferguson who is marked on the plaque with (K), Chronicle’s casualty is not shown. Andrew Hampton commanded the Rutherford County patriot militia. About 80 of them fled from Ferguson’s regiment over the mountains to the Watauga settlements in September 1780. A few of Colonel Clarke’s Georgians were also refugees at Watauga. Major Joseph McDowell was second in command of about 120 Burke County patriots, also refugees at Watauga. Though the refugees were worn and some rested at Cowpens instead of fighting, they were the residents of the turf from which Ferguson issued his threat to the “officers on the western waters” to “march this army over the mountains, hang your leaders, and lay waste your country with fire and sword.” The refugees were invaluable pilots (guides) to the fresher overmountain volunteers. South Carolina had no counties in 1780. The state was organized into districts some of which were subdivided into parishes. Though the word “county” was used off and on over the years, the BKM veterans during the 1830s referred to their homes as districts and their pension applications were certified to the federal pension bureau by district officers. In 1868 when the state switched to the county terminology, York District became York County. Colonel Edward Lacey was certainly a leader for some SC militia. Colonel Thomas Brandon deserves mention as a leader from the northern portions of the old Ninety Six District. The pension process for revolutionary war veterans required sworn depositions. One of the items in the questionnaire was the names of officers with whom they served. Not a single soldier mentioned Colonel William Hill at Kings Mountain in their pension declarations. None of the BKM patriot colonels spoke of William Hill in their letters and reports. William Hill did mention BKM in his memoirs, but did not say that he participated. The remnants from Col Sumter’s South Carolina Regiment at BKM deserve more mention than does Colonel Hill. Colonel Charles McDowell’s commission was for Burke, not Rutherford County. Units were not formal like WWII companies and regiments. The patriot militias deployed from one emergency call to another with varying groups and the officers best available for the moment. After routing the patriots at Cane Creek and chasing them into the mountains, Patrick Ferguson used Samuel Phillips (captured from Isaac Shelby’s militia) as a messenger from Burke County about 15Sep1780 to the western waters (Watauga) where Colonels McDowell and Hampton had fled. Phillips knew where Evan Shelby lives, but not where Hampton and McDowell were visiting. Shelby knew where Sevier had a horserace planned and McDowell just happened to be there. When the message was forwarded to Colonel Campbell, he was returning from helping Colonel Cleveland suppress Tory actions. Colonel Armstrong took turns guarding the New River lead mines. Lt. Newell returned home from his rotation guarding the lead mines on the day Ferguson’s threat was passed from Paperville (Shelby’s) through Black’s Fort (Abingdon) on the way to Col Campbell. The “British Forces” were not British. Major Ferguson had given up his red coat command and was functioning as Inspector General of loyalist militia forces. He recruited militia, organized, equipped, and assigned other red coat officers to train them. Ferguson also had command of provincial soldiers under Captain Depeyster. They were professional American soldiers paid from King George’s treasury. The provincials constituted about a quarter of Ferguson’s regiment. Three quarters were loyalist militia. Ferguson was continuing to recruit as he headed toward Charlotte to add a new regiment to Lord Charles Cornwallis’ army. The plan was for him to repeat the South Carolina successes in North Carolina and get even another new regiment to add to the British army.